Y’all, can I just tell you how much fun I’m having? I’m loving every single project I’m working on. I’m enjoying getting up every morning and heading into my gradually changing breakfast room and kitchen. And most of all, I’m so excited that these rooms are looking and feeling like me. After my terrible, horrible, no good, very bad year last year, it feels so nice to actually love what I’m doing again, to be excited about working on projects, and to actually be making progress and loving the results. I still have no finished projects for this month. 😀 I’m soooo close, though! 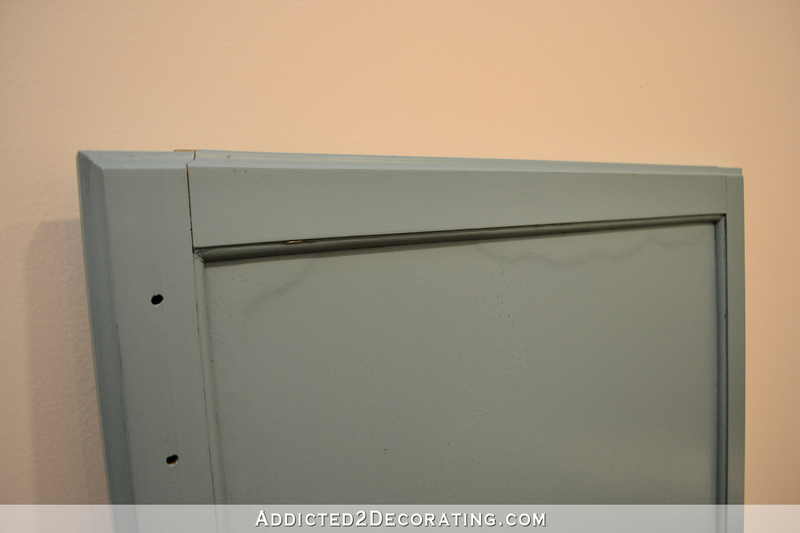 I almost have all of my cabinet doors painted. I just need a second coat on the fronts of the peninsula doors, and they’ll be done. Well, except for two. Remember when I did the initial kitchen remodel and I forgot to check the weather forecast and left some doors and drawer fronts out in the rain overnight? (If you missed that, you can click here to read about it.) Well, I did it again. The two biggest doors on the wall of cabinets are ruined. Can you see those ridges where the top and bottom of the panels soaked up rain and swelled? Yeah, there’s no amount of sanding that can get rid of that and make those look good again. So, I’ll be ordering more cabinet doors. The difference between this time and last time is that last time I actually didn’t bother to check the forecast. I had no idea it was going to rain. This time, I knew the rain was coming, and I went outside and brought in all of my tools, cabinet doors, sandpaper, paint, etc. 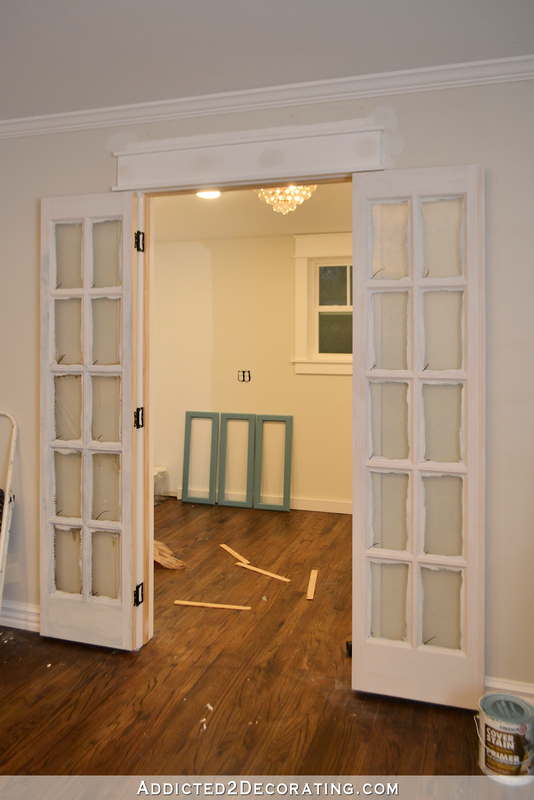 But these two doors are so big that there wasn’t enough room for them in the area where I was placing the other doors as I painted them, so I stuck these two over to the side by themselves. So when I was outside at 11:00pm cleaning up and bringing everything inside, I completely overlooked (and forgot about) these two doors off to the side by themselves. And another difference? This time I’m not really worried about it. Perhaps I even did it subconsciously. Last time, I had no idea what I was going to do. This time, I know exactly where to go to replace them. (I got my last replacements here, and they worked out perfectly.) But also, if this had to happen to any of the doors in my kitchen, I’m so glad it happened to these two big cabinet doors. The fact is, I’ve never liked them. They’re just so wide and awkward to open. So I’m going to replace the two doors with four narrower doors. They charge by the square foot, so the price should be about the same. I haven’t ordered them yet because I’ve decided to put one big door on the front of my range hood cover. Some of you convinced me that having access behind there was a good idea, even if I don’t want to use it as storage. That made sense, so I need to get the rest of that built (hopefully this weekend) so that I can get all five doors ordered this weekend. White. I know. It seems a bit tame and boring for me, right? But I promise I have a reason. And I think in the end, my plan won’t disappoint those of us who love color. I had already decided on white when I saw her photos, and I came so close to changing my mind. Those teal doors make me happy. But in the end, I chose white for two reasons. 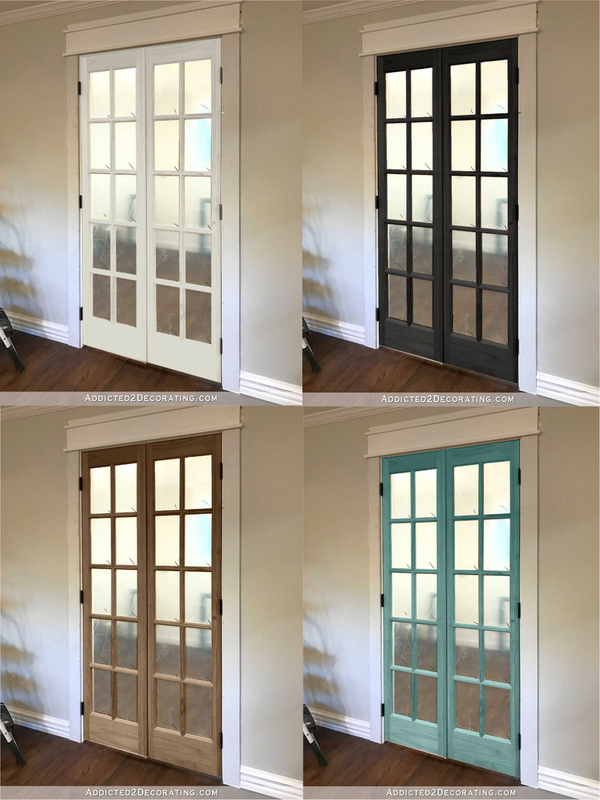 First, these doors are the exact same doors (just different width) that I used on the built-in 10-lite panels between the entryway and music room. Here’s an old picture to refresh your memory. And from the front door of the house, you can see those and the pantry doors. I think having them the same color gives a much more cohesive look. During one of my breaks from priming the pantry doors yesterday, I took a bit of time to remove two of the breakfast room curtain panels and hang them from the rings. They have clips on them, which I’ll eventually remove after I pleat the curtains and attach drapery pins. But for now, the rings were helpful. It gives me a better idea of what these will look like with a more tailored look. Just kidding. I won’t do that. But I’m very excited to get these done! And what about those kitchen countertops? It has been kind of difficult to schedule the guy to do my countertops. His schedule is busy, he’s out of town a lot, and he doesn’t always return phone calls and texts. But I finally got on his schedule, and he’ll be here next Thursday and Friday. He’ll be doing the prep work, I’ll be doing the painting, and he’ll do the clear coat. And I’ve decided to go ahead and try a marble look. Initially, I was concerned that I wouldn’t be able to make it look like “real” marble. But the more I look at pictures of real marble, the more I realize that there’s no standard look for marble in general. 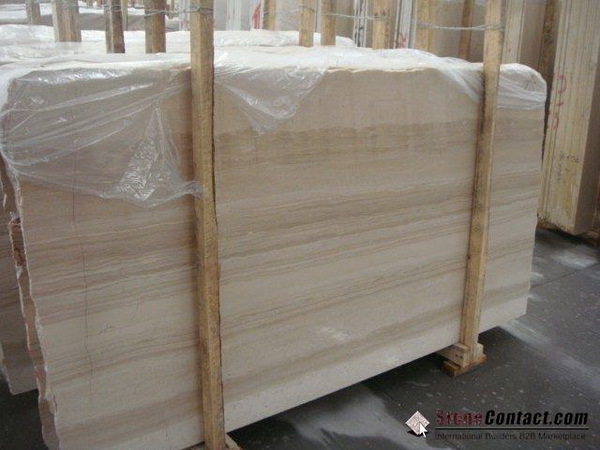 For example, serpeggiante marble has veins that run in straight-ish lines. And there are so many types of real marble out there that I’d never guess are real marble because they don’t fit that image I have in my head of how marble is supposed to look. So things are all headed in the right direction. I am starting to get a little anxious about the fact that it’s already the 17th of the month, and I have no finished projects. I also have no idea how long it’ll take for the new cabinet doors to be made and shipped here. But that’s out of my control, so I won’t worry about it. Even if I don’t get everything crossed off of my list for this month, at least I’m making progress! Wow! You make my head spin with everything you’ve done and planned. I really like that you are doing the pantry doors in white. Good choice. Oops! Sorry about your cabinet doors but I’m sure your new plan will work well. I like the drapes with the rings on them. Very clean and neat. 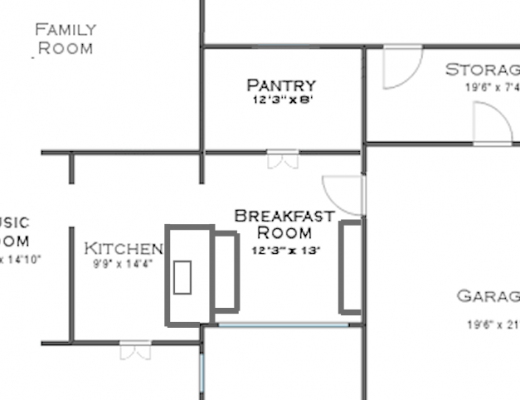 By the end of the month you should have the kitchen/breakfast room done and be able to enjoy those rooms. Have a great weekend with some time to relax, too!! I agree! You do so much! Sorry to hear about your 2 kitchen cabinet doors getting damaged in the rain, but you are managing to turn a negative into a positive by replacing 2 big ones that you weren’t so keen on and making 4 cabinet doors. I’d say that’s a win/win! 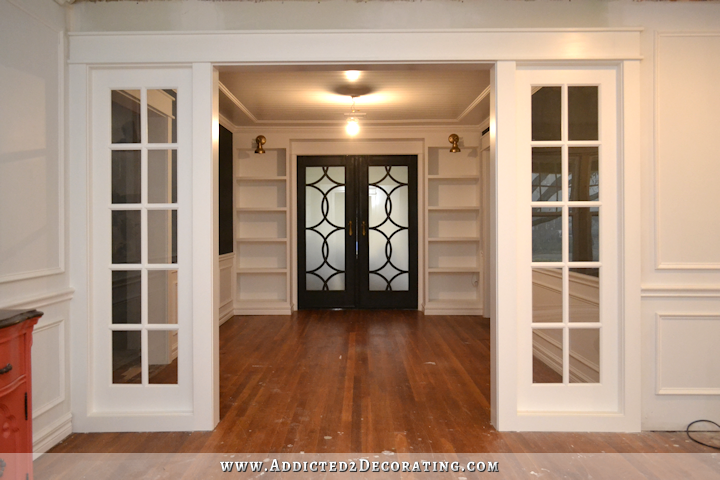 Somehow I forgot about the new glass panels at the entry to your music room, I was still remembering the pony walls, so yes, you’re absolutely right, that seeing those and the pantry doors from the front of your entryway are much better being the same white color for a cohesive look. Well done on everything Kristi, your creativity is really flowing so well and we are super excited seeing it all come together and cannot wait to see how you make your new exhaust fan hood. I’ve seen some very effective marble-y painting done with a real goose’s feather. It somehow helps to make it more random and unpredictable. Kristi, could you take another picture of your music room? The picture that you use has a light bulb hanging down and does not showcase that gorgeous light fixture that you made yourself. Ha! Every time I go searching for a picture of my music room, I think the exact same thing. I can’t believe I don’t have one with the light I made! She did an awesome. You might want to check it out. You are really moving girl! I saw this blog also and her counters look really nice! You should check it out Kristie. It’s all coming together!! Have you ever thought about maybe having baskets where the two large lower cabinet doors were? Or some other creative hidden storage? Wait. Are you changing out your concrete countertops? I love those. No, I”m keeping them. But I’m just having them refinished so that they’re lighter and whiter than they currently are. oh what are you going to use on your counter tops? I’ll be doing the painting with latex paint, but the guy doing the prep work has a special primer that he’ll use, and then he’ll topcoat with polyurea. 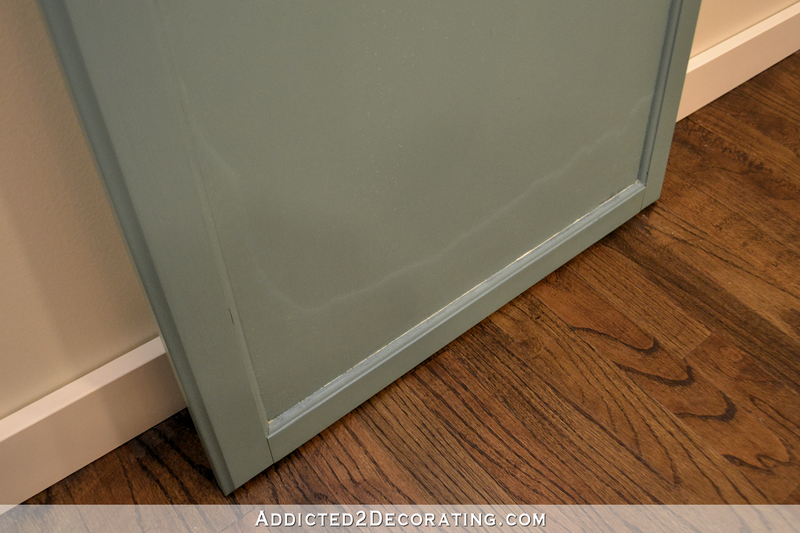 Can’t wait to see what color you have planned for the pantry! I’m excited now! I was excited ANYWAY, but that was quite the teaser! On another note, now that you have removed all of the picture frame molding from the living/dining/living room (and that molding was one of the drivers for switching from pony walls to the stationary 10-light panels) are you still happy with the 10-light panels? I thought both were gorgeous, so I don’t think you could go wrong either way. Just wondering what your thoughts were now. I’m so happy you’re going with the white on your pantry doors. I was afraid all rhe different colors would make it look too chaotic. JMHO. Can’t wait to see it all finished! Yayyy!!! I am not sure if it will help but, I follow another person that blogs and she did the marble look on laminate if you want to see more ideas but, I am sure yours will look great. Reading your blog on this has gone very well for you and I have been excited to watch your progress.GREAT JOB. I wish I had the energy to do get as much done as you. I’d love to see it! Can you leave a link to the blog? Everything is looking so beautiful! 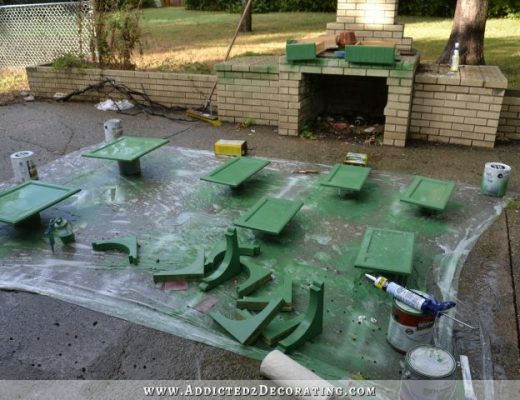 Have you thought of using some of those concrete stepping stones to practice on for your counter? I figure it’s the same material, so you can better judge your finish. Love the pantry doors white. ( But I too like that teal very much! ) Sorry about the doors, but it sounds serendipitous maybe. Kristy- if it’s not too much trouble, can you share where you found the heavy wooden looking drapery rings you used on the IKEA panels? I am looking and only finding the real thin, metal looking ones which just look, well- chintzy (in a bad way). 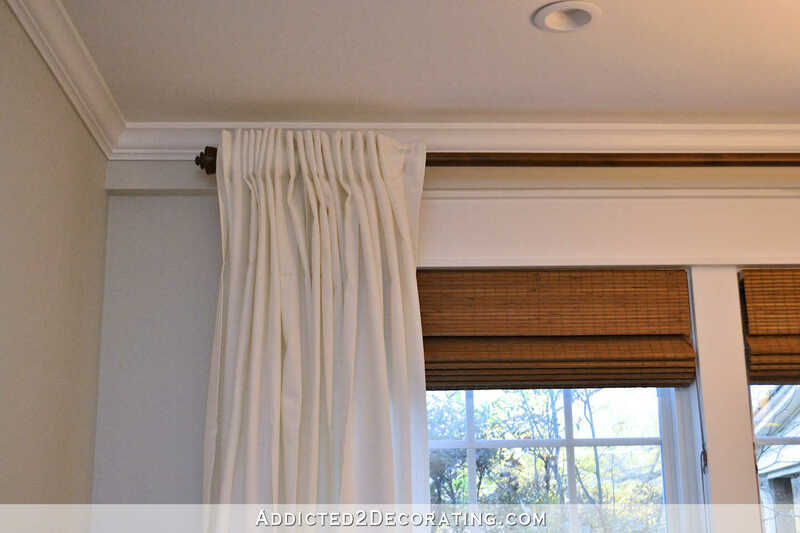 Also, what are your thoughts of using just a short length decorative curtain rod to hang stationary panels from- only the width of the panels on either end of the window and not going all the way across the whole window? I have a slider that is 155″ and it will cost me a small fortune for a rod to go across the whole expanse – which would require extra supports going across which i think would be an eyesore and since they are not going to move anyway i thought of the shorter rod look instead. Your decorating advice would be so welcomed! I got the rings (and the rods, brackets, and finials) at Lowe’s. They’re the Allen + Roth brand, and I believe they come in three colors. As far as hanging curtains on short rods, I’m personally not a fan of that look. The reason is because I’m just very particular about my draperies looking like they’re functional, even when they’re almost always stationary panels just for decoration. When they’re hung on the short rods, it’s obvious that they’re just panels of non-functional fabric. 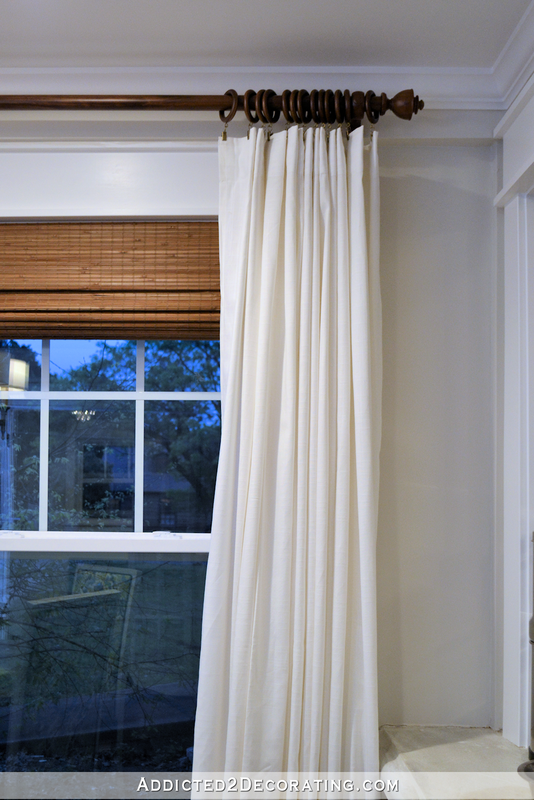 So I like full rods, and I like the appropriate width of fabric depending on the width of the window (i.e., not using just a single width of fabric on either side of a really wide window). I always want them to look like they could close and be functional if I want them to be. Kristy! Thank you so much for your personal reply and detailed solution for my situation. That certainly was above and beyond! I appreciate your advice and admire the way you think. You don’t settle for just getting any old thing done just for the sake of calling it done. I’m like that too and realized it after reading your post. I know I just wouldn’t be happy in the long run with the short rod look. I had checked out the Lowes products online and I was going to use two 8 foot wood rods to just have one joint in the center that I would have to support with a bracket rather than three 6 foot rods which would require 2 extra brackets to support the 2 extra joints. I was concerned the extra bracket(s) would visually block the smooth line of the long rod which I don’t think I’d like at all. I resigned that I would have to have at least the one in the center. That is, of course, until I read Barbara’s solution below which is a GREAT idea which I will definitely ponder. Thanks again to you Kristy, SO much for your personal reply! I know you are so busy at your home and just wanted to let you know I think I speak for many when I say we enjoy your trials and tribulations for all your projects! I especially like your sharing HOW you came to the decisions you finally decide on. I love the process of your working it out in your head first and sharing your sharp mental skills, let alone your carpentry skills too! You are the real deal and just don’t make it look pretty without any pain! So happy I came across your blog! Check in every day/twice a day- in the hopes you might have posted an update! Yes- “My name is Joanne and I am “addicted to Addicted2decorating”! But no pressure here to share even more than you already do! You are an inspiration! Happy Homemaking! Joannne, I have very wide windows and am not able to have a support in the middle, because there is another glass panel above. So instead of wood which would sag, I had a length of 2 inch diameter pipe cut for me at Home Depot. Then I painted it to look like wood and match the brackets and finials, which I was able to insert into the ends with only a little bit of work. It looks great! Very similar look to Kristi’s pictured above, I did pleats and used drapery hooks. Thanks so much, Barbara, for sharing your personal solution. That is a great idea too! While I do like the ribbed wooden rod, in the interest of a long term (and probably cheaper!) solution I will definitely check out that option. I will “consult” with my handy hubby who is way too talented and handy for his own good! Here’s to girl power in decorating and all things home! Thanks again for sharing your great idea! I’m glad you liked the Photoshopped doors :-). I love the idea of white doors with colorful cabinets peeking through. 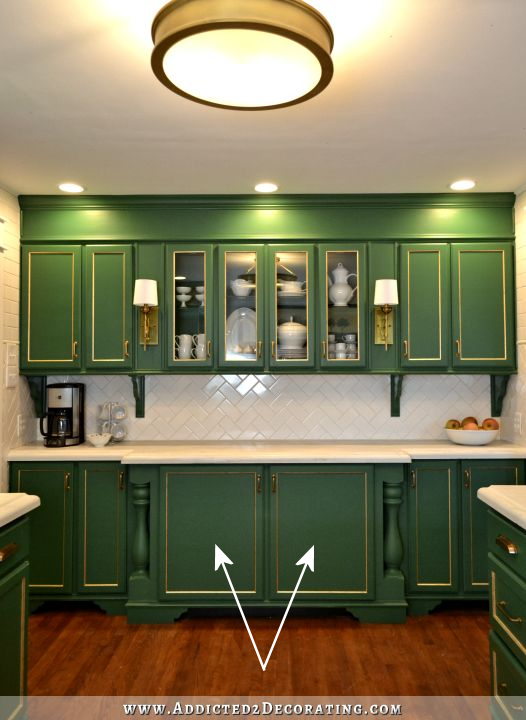 Especially if the cabinets are a beautiful green color. I’m excited to see what you have planned.